Virile crayfish (Orconectes virilis) is a medium- to large-sized freshwater crustacean. It is widespread and abundant across North America. It is native to central United States and Canada, from Quebec to Tennessee in the east, to Alberta and Colorado in the west. It is introduced and considered invasive outside of its native range from coast to coast. 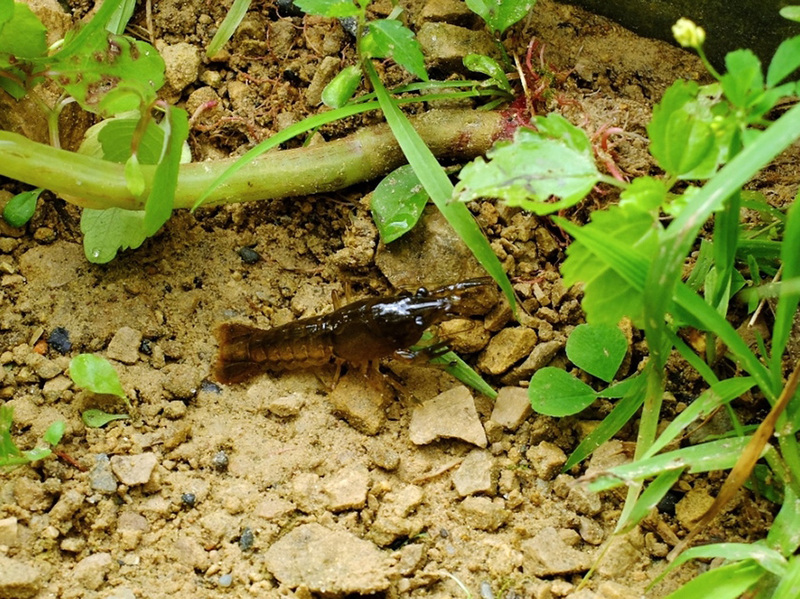 Virile crayfish prefer streams with rocky bottoms, moderate flow and turbidity, abundant cover, and stable water levels. They often use rocks, logs, or other organic debris as cover. They occasionally dig burrows into muddy banks, especially when water levels are low. To survive the winter, they migrate to deeper water that does not completely freeze and they become inactive. Virile crayfish are identified by the dappled, olive-brown body with pairs of dark brown splotches on the abdomen; the shape of the shield (carapace) covering the front part of the body; and the broadly flattened, usually bluish claws. This entry was posted in Crustaceans and tagged Orconectes virilis, Virile crayfish on July 4, 2018 by John Valo.